• Worst Thanksgiving Week in Decades. U.S. stocks ended lower in last Friday’s holiday-shortened trading session, extending sharp declines earlier in the week to push the S&P 500 into correction, down 10% since its September record high. Although trading was quiet with volume more than 30% below its 30-day average, Friday’s pullback marked last week as the worst Thanksgiving week for the S&P 500 since 1939. Energy companies led the decline with oil slumping below $51/barrel, a new 2018 low. Oil has plunged 32% since the week ending October 5. • Weekly Performance. For the week, the S&P 500 sank 3.77%, the Dow Industrials slumped 4.44% and the tech-heavy Nasdaq Composite lost 4.25%. • Durable Goods Orders Fall. New orders for durable goods fell by 4.4% in October, led by a drop in aircraft orders, especially from the military. Separately, the University of Michigan said consumer sentiment for November eased from 98.3 to 97.5. • Defensive Stocks Fall the Least. All 11 major sector groups ended negative last week, with Technology (-6.07%), Energy (-5.00%) and Consumer Discretionary (-4.25%) down the most. Utilities (-1.35%), Real Estate (-1.46%) and Consumer Staples (-2.35%) fell the least. • Treasurys Were Quiet. Treasurys ended slightly higher on Friday, sending the yield on benchmark 10-year Treasury notes down 2.3 basis points to end the week at 3.041%. Prices and yields on ten-year notes held steady ahead of the Thanksgiving holiday. The U.S. Dollar Index gained 0.47% last week to end at 96.916. Meanwhile, WTI crude oil futures plunged over 7.7% on Friday, extending its weekly decline to over 11%. Oil retreated for a seventh week as doubts persist whether OPEC and its allies can reduce production enough to end a global oil glut. Friday, November 30: Chicago MNI Purchasing Managers Index (PMI). 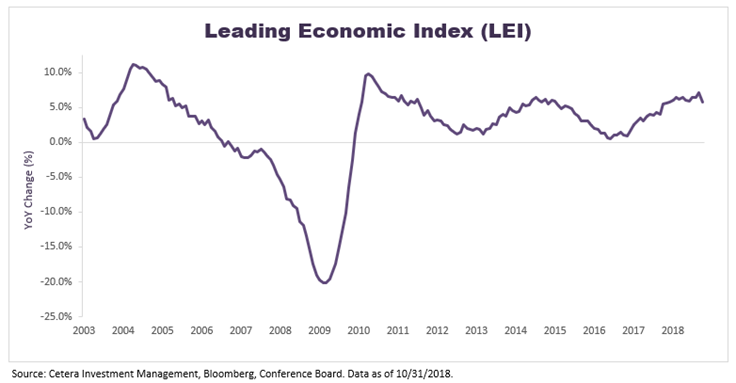 The Conference Board’s Leading Economic Index (LEI) is a composite of 10 forward-looking economic indicators. The LEI increased narrowly to 112.1 in October from 112.0 in September, extending its upward trend. The year-over-year (YoY) change dropped slightly from 7.2% in September to 5.8% in October and has been positive for 107 straight months. This indicator rises ahead of economic strength and falls ahead of economic weakness. It is a concern if the LEI peaks and slows to negative YoY growth. The LEI has peaked an average of 11 months ahead of the last seven recessions. This indicator has not peaked yet in this cycle and is still signaling strength for the U.S. economy in the months ahead.